Order A. Vogel (Bioforce) Bio-Propolis Barrier Ointment from the Online Health Food Store UK. 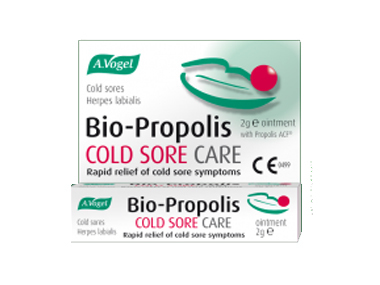 Buy A. Vogel bio-propolis cold sore barrier ointment and other quality First Aid safely online in the UK. Speeds up healing time of cold sores. Bio-Propolis ointment can help to soothe your cold sores - even if they have already erupted. The great benefit is that if you miss the tingle stage, it will still work. Our UK Health Shop sells real A. Vogel (Bioforce) and other First Aid from top-quality brands safely online to customers throughout the United Kingdom in England, Wales, Scotland and Northern-Ireland. Where to buy A. Vogel (Bioforce) Bio-Propolis Barrier Ointment safely online? Shop at the Online Health Food Store if you are wondering where you can buy A. Vogel bio-propolis cold sore barrier ointment safely online in the United Kingdom. Our Health Shop is located in the UK and our award-winning independent has been serving customers in England, Wales, Scotland and Northern-Ireland since 1976. You can buy our First Aid online and we post out orders to any UK address. Bio-Propolis Barrier Ointment - A. Vogel bio-propolis cold sore barrier ointment in First Aid and Medicinal Skin Care.